Power banks and portable chargers (aka portable charging stations) connect to your phone, tablet, laptop or other devices charging port: allowing you to charge your device anywhere you may be. Power banks and chargers are usually rated by there charging capacity which is measured in mAh (milliamp-hours), the higher this value, the better the charge that can be provided. Mobile phone and laptop batteries are also rated in the same way, so for example the iPhone 5S battery for example has a 1500mAh battery, so if you buy a power bank or portable charger rated at 3000mAh, you can fully charge your iPhone from completely flat twice. However this only works in theory, power banks do not deliver their full advertised capacity to your device as some of this energy is lost through heat and voltage conversion. Unless the power bank manufacturer states otherwise, expect around 70 percent efficiency (for example a 3000mAh power bank will therefore deliver around 2100mAh). Chargers are also sometimes rated by their charging rate in A (amps), the higher this rating, the faster they will be able to recharge your laptop or phone – note you should always check the manufacturers rating for your device to ensure you do not exceed the maximum charging rate in order to protect the longevity of the battery. Buying a large-capacity power bank is often a good idea if you have multiple devices that you need to keep charged while on the move, but don’t forget that the higher the capacity, the longer it will take to recharge the power pack. In fact, 15,000mAh capacity chargers will usually need be charged overnight as they will take 8+ hours of mains power to fully charge. Another factor is of course the size and weight, generally speaking, the higher the capacity of the charger, the heavier and bulkier the device will be. Pass-through charging is another option to consider, this essentially means you can charge up portable devices whilst your power bank is charging from the mains, however some manufacturers will not recommend charging their devices in this way as constant pass-through charging may affect the battery’s lifespan. 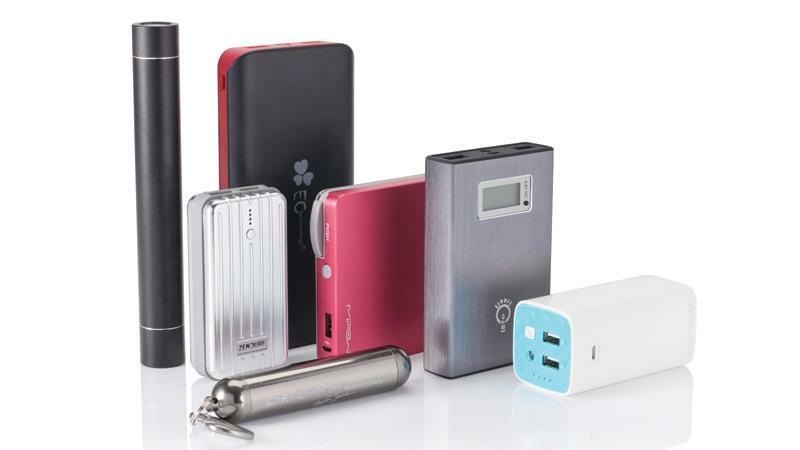 Portable power banks usually come with a variety of options for connection, but some are designed specifically for certain devices and may not be compatible with other devices. When choosing a power banks or portable charger you need to check type of connection and cable provided. For example Micro USB is the most common connector for charging smartphones, so USB power banks that have adaptors/sockets/connectors and cables for standard USB, micro-USB and USB Type-C (or USB-C) are very useful. However new Apple devices such as the iPhone 6s use a Lightning connector – so always check your phone or laptops user manual for the correct cables and connectors required. If you are buying a charger to top up more than one device, choose a charger that has a set of adaptors that will connect to a variety of smartphones and other devices, the best power banks are capable of charging many different devices and also will provide a number of charging ports so you can charge more than one device at the same time. The most popular and reliable brands on sale currently in the UK include Lumsing, Emie, iHarbort, Intocircuit, OnePlus, Anker, Easyacc, Zendure and Aukey.